[Updated] The latest rumour in today from Germany's Mac Life is that Nike is thought to be releasing its SportsBand keep-fit personal trainer wrist device in Europe next month, at a rumoured €59.95 (£45). TechRadar spoke with Nike reps in the UK today to get confirmation on this. We were informed that there is currently no release date or pricing set for Europe, but that we should hear more on the Nike SportsBand towards the end of March. The wrist device measures your time, speed, distance and calories burned up and, just like the Nike+ iPod system, allows you to track and log your jogging prowess on your Mac or PC. TechRadar is a big fan of Nike+, the awesome technology from Nike and Apple which does something magical – it makes jogging almost fun! 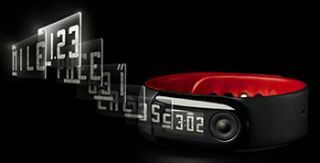 – so we look forward to hearing more about Nike SportsBand in the coming weeks. The strange thing about the SportsBand is that it seems to do everything that Nike+ on iPod does, but without the fun bit (ie the tunes). But for those who prefer to jog with no music it looks like it should be a nifty bit of keep-fit kit. The Mac Life rumour goes on to state that users will need the full Nike+ sports kit and Nike+ running shoes to make use of the SportsBand, but TechRadar suspects this to not be the case. Otherwise, why would the user have any inclination or need to buy an additional SportsBand device? Stay tuned for more on Nike+ and Nike SportsBand in the coming weeks.